seven pair of snam-garnet gold buttons, value 6 l. 6 s.
six pair of garnet ear-rings, set in gold, value 3 l.
one other pair ditto, value 8 s.
one pair of Moco buttons, set in gold, value 1 l. 15 s.
two pair of ditto, value 2 l.
two pair of clutter ditto, with garnets, value 3 l.
one pair of crystal ditto, value 18 s.
two pair of small ditto, value 1 l. 8 s.
one three stone topaz gold ring, with a diamond, value 1 l. 14 s.
one ditto amethyst with diamonds, value 1 l. 13 s.
one ditto, value 1 l. 3 s.
one ditto, value 1 l. 4 s.
one ditto, garnet with diamonds, value 1 l. 5 s.
one stone ditto with garnets and diamonds, value 6 l.
one single garnet stone ditto, value 1 l.
one single crystal stone ditto, value 17 s.
one sapphire ditto, value 1 l.
one Moco ditto, value 18 s.
four Moco ditto, set round with garnets, value 4 l. 4 s.
one cluster garnet with hair in it, value 1 l. 3 s.
one case for rings, value 2 s.
one pair of three drop cluster garnet ear-rings, set in gold, value 8 l.
a pair of single drop ear-rings, with knots in silver, value 1 l. 1 s.
six pair of fancy ear-rings, and cases in silver, value 5 l.
a girdle buckle in silver, value 10 s.
a pair of crystal buckles, set in silver, value 15 s.
a pair of topazes ditto, set in silver, value 2 l. 12 s. 6 d.
a pair of children’s stone buckles, in silver, value 10 s.
a pair of knee stone ditto, in silver, value 8 s.
a stone shoe buckle, in silver, value 12 s.
one child’s silver buckle, value 2 s.
a pair of garnet shoe buckles, in silver, gilt, value 2 l.
a pair of crystal ditto, in silver, value 18 s.
a pair of cluster garnet buttons, in gold, value 1 l. 15 s.
three silver and twelve gold ear-rings, value 1 l. 1 s.
thirteen stone buttons, set in silver, value 18 s. 6 d.
one pair of cluster studs, value 2 s.
three gold diamond rings, value 6 l.
one ditto false stone, value 5 s.
three pair of stone buttons, set in silver, value 1 l. 2 s.
one pair of garnet buttons, set in gold, value 18 s.
one pair of cluster Moco, set in gold, value 1 l. 10 s.
one pair of crystal ear-rings, set in silver, value 6 s.
one pair of cluster paste, set in silver, value 7 s.
one heart trinket, set in gold, value 7 s.
one gold seal, value 1 l. 3 s.
one pair of stone knee buckles, set in silver, value 8 s.
a purple paste hoop-ring, set in gold, value 12 s.
two paste crosses in silver, value 12 s.
one pair of large garnet buttons, set in gold, value 3 l.
four pair of Moco ditto, set in gold, value 4 l.
four pair of garnet ditto, set in gold, value 4 l.
three pair of Moco studs, set in gold, value 2 l. 5 s.
one pair of garnet ditto, set in gold, 1 l.
six pair of single drop ear-rings, set in gold, value 3 l. 12 s.
two pair of three drop ear-rings, set in ditto, value 3 l. 3 s.
five pair of garnet and topazes, set in ditto, value 1 l. 17 s. 6 d.
one pair of night ear-rings, value 11 s.
thirty hoop rings in gold, some paste, some garnets, value 14 l. 16 s. 6 d.
five gold seals, value 8 l. 8 s.
four diamond rings, value 8 l. 8 s.
about thirty rings, value 12 l. 13 s.
nine garnet buckles, set in gold, value 5 l.
about fourteen gold lockets, some sapphires, some garnets, value 2 l. 10 s.
two pair of sham garnet buckles, set in gold, value 1 l. 16 s.
five stock buckles, value 2 l. 10 s.
five shirt buckles, set in silver, 2 l. 5 s.
about three pair of fancy ear-rings, value 2 l. 12 s. 6 d.
about twenty-four pair of stone shoe buckles, value 19 l. 4 s.
about twenty-eight stone knee buckles, value 11 l. 10 s.
a large garnet unset, value 3 l.
a mettle watch-case, value 12 s.
about six pair of gold wires, and one gold ring, value 1 l. 1 s.
one cluster locket, value 1 l.
about twelve pair of silver shoe buckles, value 7 l.
two heart trinkers, value 14 s.
one garnet cross, set in silver, value 4 s.
twelve large waistcoat buttons, silver, value 12 s.
four breast buckles, value 1 l. 8 s.
three girdle buckles, value 1 l. 4 s.
one solitair, value 1 l. 4 s.
and sundry pieces of small money, in a chip box, value 10 s. 6 d.
As the charge sheet’s thorough inventory suggests the jeweler knew his business — or rather, it was known by his wife Mary Knight, who with the man of the house laid up with illness very coolly delivered the court the testimony that would hang their thief. It seems the Knights had the diligence to inscribe a business sigil on most of their pieces, and even on their business papers. It was this that enabled their property’s recovery. The “Blind Beak of Bow Street” — “beak” was just slang for someone in charge — John Fielding had followed his half-brother Henry as London’s chief magistrate. Together the Fieldings fathered policing in England, Henry as the pioneer before his sudden death in 1754, and the energetic and innovative John for the quarter-century following. Incredibly from the standpoint of posterity, London at around 700,000 souls mid-century had no professional police; indeed the populace was bitterly suspicious at the idea as tending to despotism. Despite favorably describing autocratic France’s far more developed marechaussee, the English observer William Mildmay remarked that “such an establishment is not to be imitated in our land of liberty, where the injured and oppressed are to seek for no other protection than that which the law ought only to afford, without flying to the aid of a military power” as the latter would be “either dangerous to our liberties or unconstitutional to our form of government.” The French critic Le Blanc, abroad in England in the 1730s, was perplexed by his hosts’ preference for the taxation of highwaymen to that of any state organ that might secure the roads. Those institutions of public security that existed in the Great Wen* were a wormeaten quiltwork of minutely local and almost determinedly ineffective entities, and “there was a rivalry and jealousy rather than co-operation and mutual help between the Watch, King’s Messengers, Press Messengers, city marshals and sheriffs, and the other ad hoc bodies.” (Frank McLynn, Crime and Punishment in Eighteenth-Century England) Meanwhile, the responsibility to investigate and prosecute crimes after the fact fell to victims themselves, and these prospective vendettas were so prohibitive that neighbors were known to form “prosecution associations” to insure one another against the expense. The acme of the perversity had been attained in the 1710s-1720s business empire of Jonathan Wild, the “thief-taker” who was simultaneously the criminal kingpin, ingeniously skimming the margins on the city’s entire economy of robbing, fencing, and private rewards. This was the world that the Fieldings set themselves to remake. 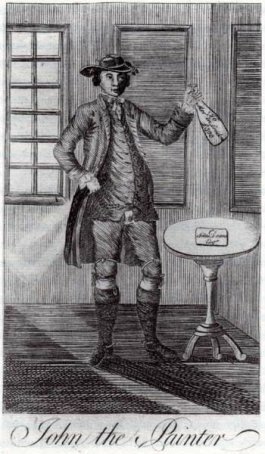 When he attained the magistracy in 1748, Henry set up his home in Bow Street as the headquarters of a protozoan police force. Six constables of his recruit would be the founding coterie of what was soon known as the Bow Street Runners. His kinsman and assistant John would inherit leadership of this enterprise in 1754 and make it his life’s work. With a state stipend that grew over the years with his successes, John Fielding made the long-dubious racket of thief-taking into a respectable office, his tireless pen relentlessly advertising (exaggerating, McLynn claims) the honesty and effectiveness of his enterprise and forever “dragg[ing] the unwilling authorities in the direction of the creation of a national police force.” (McLynn again) Fielding kept his offices open for long and reliable hours; in the case we have at hand, the first search warrant for John Andrew Martin’s lodgings was granted not by he but by a subaltern while Fielding was out at dinner. He also widened his constables’ investigative scope beyond the narrow parishes to which they had historically been attached, and counseled Parliament on policy. He was particularly busy here in the 1760s, as a crime wave following the post-Seven Years’ War demobilization was engulfing London. * The term “Great Wen” as a slur for London wasn’t coined until the 1820s, by radical journalist William Cobbett, a great advocate of rural England.